Gets a line from the stdin stream. These versions of gets, _getws have security enhancements（安全加强）, as described in Security Features in the CRT. Storage location for input string. The gets_s function reads a line from the standard input stream stdin and stores it in buffer. The line consists of all characters up to and including the first newline character ('\n'). gets_s then replaces the newline character with a null character ('\0') before returning the line. In contrast, the fgets_s function retains（保留） the newline character. If the first character read is the end-of-file character, a null character is stored at the beginning of buffer and NULL is returned. _getws is a wide-character version of gets_s; its argument and return value are wide-character strings. If buffer is NULL or sizeInCharacters is less than or equal to zero, or if the buffer is too small to contain the input line and null terminator, these functions invoke an invalid parameter handler, as described in Parameter Validation. If execution is allowed to continue, these functions return NULL and set errno to ERANGE. In C++, using these functions is simplified by template overloads; the overloads can infer buffer length automatically (eliminating the need to specify a size argument) and they can automatically replace older, non-secure functions with their newer, secure counterparts. For more information, see Secure Template Overloads. The secure functions do not prevent or correct security errors; rather(而是）, they catch errors when they occur. They perform additional checks for error conditions, and in the case of an error, they invoke an error handler (see Parameter Validation). Most of the security-enhanced CRT(C运行时) functions and many of the preexisting（先前存在的) functions validate their parameters. This could include checking pointers for NULL, checking that integers fall into a valid range, or checking that enumeration values are valid. When an invalid parameter is found, the invalid parameter handler is executed. 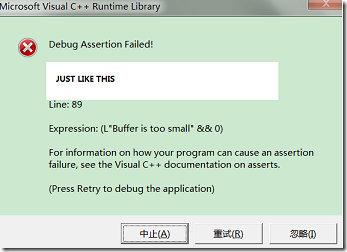 This behavior can be changed by using the function _set_invalid_parameter_handler to set the invalid parameter handler to your own function.（note：你可以通过set_invalid_parameter_handler 函数来设定无效参数 的处理机制到你自己定义的函数） If the function you specify does not terminate the application, control is returned to the function that received the invalid parameters, and these functions will normally cease execution, return an error code（note:这个收到无效参数的函数会正常地结束执行，并返回一个错误码。注意反省一下，自己在处理相应的问题时，对于非法输入是都能返回相应的错误码。ASK:在编程时如何利用函数返回值和errno值？？？？）, and set errno to an error code. In many cases, the errno value and the return value are both EINVAL, indicating an invalid parameter. In some cases, a more specific error code is returned, such as EBADF for a bad file pointer passed in as a parameter. For more information on errno, see errno, _doserrno, _sys_errlist, and _sys_nerr.